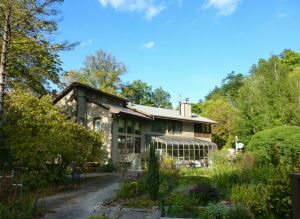 The Inn on Mill Creek Bed & Breakfast is tucked two miles into Pisgah National Forest on seven private wooded acres, just minutes from downtown Black Mountain and Old Fort. We offer spacious, comfortable rooms, each with its own private bath. Full breakfast is served overlooking the National Forest. And we have plenty of space for you to relax, reflect and take your vacation at your own pace. Or check out hiking, biking, sightseeing, birding, geocaching and more in our neck of the woods. In addition, the Inn on Mill Creek is a site on the North Carolina Birding Trail and we are proud members of our state association (NCBBI) and our local chambers of commerce. Please visit our website to check availability and make reservations.